In my recent visit to our homeland late 2011, I purchased and read Floro Quibuyen's book "A Nation Aborted." Obviously, Quibuyen presented a different spin (expected especially if one's position is to critique another's interpretation of history). His book dwelt mainly on Rizal and latter's defense (which Simbulan claimed); i.e. to show that Rizal was revolutionary. There is no question that Quibuyen has come out with new historical information/documentation about Rizal to support his position. In any conversation, to be truly meaningful, it is always good to define early and preferably agree on terms being used. For me, to be revolutionary is to use force, to engage in the violent overthrow of the ruling regime/system. Thus in this case, Spanish colonialism and by extension, our native Katipuneros fighting the new invaders: the Americans as interventionist, colonialist/duplicitous foreigners. To be less is, at best, being a reformist. Thus to me, Rizal is a reformist. We may not like the injection of the term "classes" in socioeconomic-political discussion, but the reality is that classes do exist and that classes exhibit some predictable attitudes and behaviors in society - though there may be no absolute agreement between individuals within each class. Rizal was of the ilustrado class,i.e. relatively wealthy and educated class. Rizal was apparently one of the rare exceptions in his socioeconomic class since he empathized with the poor of his time. But to a significant degree, his thoughts and actions still reflect those of his ilustrado class. I also do not know/understand why Quibuyen would feel insulted when Simbulan wrote that his book as pleasing to the Jesuits and its publishing house (or Ateneans who brag about Rizal being a fellow Atenean, a few Atenean friends of mine do too). Personally, I was thinking similarly, given that Jesuits in the Philippines were mostly Americans during American colonization, post-WW2 and up to the recent decades. I guess Quibuyen exhibits the (our) typical Filipino sensitivity here. Quibuyen plays up Rizal's supposed ethical prerequisites to the national sentiment. As much as I agree that ethics (attitudes and behaviors) must be present in civil society, but they are not imperative nor attainable in a revolutionary situation, as revolutions are often, if not always, necessarily violent to attain radical socio-economic/political changes --as seemingly the case in our homeland. As the EDSA-1 demonstrated, trying to be a civil society right after the fall of the Marcos dictatorship, Cora Aquino with her and family being part of the ruling socioeconomic class, public religiosity, her churchy supporters, and desire to please the world or assure America in particular, destroyed the one, rarest opportunity for the needed radical changes in our economic and political fields. our national patrimony horded away/destroyed by foreigners. All facilitated via cultural globalization (cultural imperialism), i.e. began even before the term was coined. Via our Americanized education and greatly reinforced by the tsunami of foreign media (again mainly American) has completely alienated us native Filipinos from our own Filipinism/Filipino nationalism; and to think more like the them, and worst, to identify/see foreign interests as good for ourselves natives. All these disastrous conversions to our homeland and alienation of our native Filipino people have accelerated towards completion eversince, thanks to our so-called leadership, then and now. I wished that both Prof. Renato Constantino and Prof. Teodoro Agoncillo had the chance to read this newly released book about Rizal. The book is based on the author's doctoral dissertation at the University of Hawaii. However, Constantino and Agoncillo are no longer with us to parry this most recent critique of their works. Unlike the movie, Bayaning Third World, which raises irreverent questions about Rizal's life, this book defends Rizal and reverently shields him from all the previous historical skepticism of the voluminous Rizaliana which the 20th century has produced. Quibuyen's book in general is a critique of what is referred to as the dominant or mainstream Constantino-Agoncillo thesis that Rizal was fundamentally not a revolutionary but a reformist. In inviting its readers "to recover a lost history and vision, to reread Rizal, rethink his project and re-vision Philippine nationalism," the book meticulously reviews the earlier assessments on Rizal and his role in the 1896 Revolution as well as his contemporary relevance. 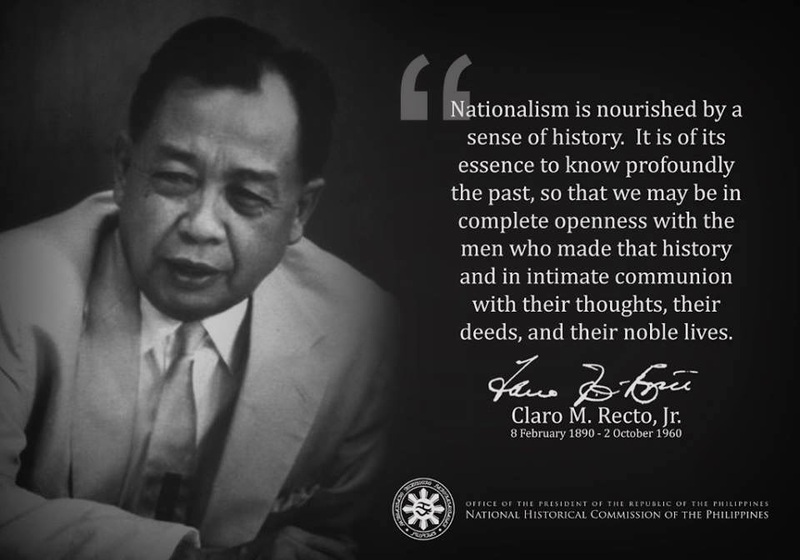 But then, the book has created, or shall we say, added a new religion, to the already dozens of Rizalistas and cultists in our midst who have "not seen nor heard nor spoken evil" about Rizal. Was Rizal a revolutionary? Why did he condemn the revolution that was to be waged by the Bonifacio-led Katipunan? Was there a retraction by Rizal before his execution? These are questions the book tries to argue favorably and positively for Rizal. I am sure that this is a book that our good Jesuits who are so proud to have educated Rizal would have dreamed of writing, publishing and promoting themselves (they actually published it through Ateneo University Press). What Quibuyen calls Constantino's viciousness in denigrating Rizal and giving him up to the enemy is matched by an almost perfect picture of Rizal. Rizal here is a saint to be worshiped a demigod to be transformed into a religion. This does not do justice to Rizal and is an extreme adulation of our national hero who, instead of being treated as one of us, is molded into a religious relic by Quibuyen. Defending Rizal from his critics does not necessarily give justice to him. Perhaps the critics of Rizal were not out to belittle or devalue him but to present the human Rizal, as flesh and blood, with virtues and vices, strengths and weaknesses like any other mortal. Quibuyen confronts and takes to task Constantino's assertions that while Rizal was an ilustrado reformist who was seeking our assimilation with Spain, Bonifacio was the real plebeian revolutionary who guided and led the independence struggle. This line of thinking, according to Quibuyen, had been at the expense of Rizal. To accomplish this, Quibuyen has instead painted a flawless Rizal. Every positive word or letter of Rizal as well as documented testimonies from his associates and contemporaries and biographers are harnessed to support the view that he was after all a consistent revolutionary. But Quibuyen is unconvincing. For Rizal's deeds were inconsistent with this revolutionary zeal. Of course, this can be explained by the fact that he was a complex, sophisticated man. Why was Rizal willing to serve the Spanish army as a medical doctor against Cuban revolutionaries when he was arrested and sentenced to die? His actions while he was in Dapitan in captivity only show how much trust he had in the Spanish authorities in whose hands he placed his life. He could have escaped when there was a chance and when the opportunity was offered by the Katipunan. But he instead told the Katipunan that he had even given his word to his colonial captors that he would not escape and would behave well. For if he was indeed a revolutionary, he must have been an armchair revolutionary. He could have been a Jose Marti, the Cuban writer and revolutionary who led the Cuban people's revolt against Spain. But he passed up these challenges and opportunities. Still, Quibuyen insists that Rizal was a revolutionary, both in word and deed. But history is usually kind to its victims. It sacrificed Rizal at the altar of martyrdom and immortality, a Rizal showing the world and his people that one could die unafraid, proudly and with dignity for one's country. This was the Rizal that was the subject of veneration by the Katipunan and the popular imagination of the masses, and one that continues in some of our millennarian movements. That was how that martyrdom was used by the 1896 revolutionaries, as Rizal was already a personality known for his well-rounded genius, his open defiance to the clerico-fascist friars through his novels and other writings. The Katipuneros whom Rizal had condemned began spreading the word that Rizal was actually their adviser and his dramatic death geometrically multiplied the ranks of the Katipunan that even his beloved Josephine Bracken and his brother and sisters later joined it. The author Quibuyen even provides the insightful detail based on the memoirs of General Santiago Alvarez that Rizal's last poem handwritten in Spanish on the eve of his execution, that is, "Mi Ultimo Adios" (My Last Farewell), was directly and immediately given by Rizal's family to Andres Bonifacio who translated it into its first Tagalog version. Rizal's death signified the death of reformism, the futility of the passive resistance to an armed colonial power. He was the unifying personality for all forces that had grievances against Spain. The behavior of the Rizal family after his execution towards involvement in the Revolution was not necessarily because Rizal had encouraged them to do so. It was the logical outcome of the Rizal family's personal humiliation and sufferings in the hands of the Spanish colonial authorities and the friars, and the last straw was Rizal's death. In the contemporary era, it is not unusual for members of a family whose kin is a victim of atrocities or militarization to join the armed insurgency. Many have joined the continuing insurgency not necessarily because of ideological reasons, but of personal injustice against a family member. So when Rizal's family participated later in the Revolution, it was not proof that the martyred Rizal was himself a revolutionary on the premise that he had encouraged their later behavior. No one can disagree with the author that Rizal was useful to the 1896 Revolution as he still is to the contemporary era of corporate-led globalization. But in assessing Rizal, one must distinguish between his words, on one hand, and his deeds on the other. Can Rizal be judged as a revolutionary based on his remarks during his moments of personal desperation as when his family's land was land-grabbed in Calamba? Or just because his family, including Josephine Bracken, joined the Revolution after his martyrdom at the Luneta? Or because his name later became a battle-cry of and inspiration to the Katipuneros? Can we say that his conscious and premeditated martyrdom was more effective to the revolution against Spain than if he were alive to lead it? We can only speculate that had he lived to lead the 1896 Revolution (although his deeds showed that he had no intention of doing so), he might have prevented the senseless death of Bonifacio and later the capitulation-ism of the elitist leaders under Aguinaldo that spelled the doom of the Revolution on its second phase, that is, the The Philippine-American War (The First Vietnam). But it is much easier to speculate. We can only be sure of one thing: a legend created by martyrdom becomes immortal, and even undergoes a purification process that makes us forget the mistakes and shortcomings of the martyr, even the seemingly unforgivable ones. The martyr knew he was doomed if he did not escape but still followed the path of martyrdom. Martyrdom, despite the martyr's shortcomings in his life, tends to create saints. For is this not like Ninoy Aquino's own martyrdom that will never die in the imagination of the people? I must commend the author for his meticulous review of almost all the interpretations of Rizal from Gregorio Zaide, Teodoro Agoncillo, Renato Constantino, Reynaldo Ileto, etc. He revives and supports the favorable interpretations about Rizal written by Fr. John Schumacher, Cesar Adib Majul, Zeus Salazar, Setsuho Ikehata, Igor Podveresky and Austin Coates. But almost. For he committed a grave sin of omission by not including the favorable interpretations of then Kabataang Makabayan (KM) national chairman Jose Ma. Sison about Rizal, an assessment that became one of the most widely read interpretations in the 1960s and the era of the First Quarter Storm. This was in Sison's essay, "Rizal the Subversive" published in the book Struggle for National Democracy. This would have supported the author's own positive interpretations about Rizal, though Sison merely used Rizal and his martyrdom to show the futility of reformism and to direct it towards the revolutionary road. Rizal was indeed subversive to the interests of the friars and colonialist Spain, but that did not make him a revolutionary. Even then, the reformist Rizal became useful to the revolution by his martyrdom. So while he had earlier refused to join them, Rizal was described later by Andres Bonifacio as the "symbol of Filipino freedom". Rizal was later on also declared as "the Soul of the Philippine Revolution" by General Emilio Aguinaldo through the Revolutionary Decree dated Dec. 20, 1898. I would have been happy to see a discussion of Rizal's relevance in Asia today in the face of the challenges of globalization. Some Asian leaders like Mohammad Mahathir of Malaysia are encouraging the use of the "pride of the Malay race" - Rizal's life and works - to bring about an Asian renaissance and an Asian identity and perspective as a counterpoint to the rampaging cultural impact of Western-led globalization. This book will surely disturb the disciples of Renato Constantino and Teodoro Agoncillo for its daring and stinging critique of their icons whom Quibuyen accuses not only of "fundamental theoretical as well as historiographic errors" but also of having an "essentializing and dichotomizing mind-set." Quibuyen asserts that Rizal was indeed a revolutionary theoretician of the 1896 revolution, but this kind of Rizalism is in danger of becoming a cult, if not a religion. He presents testimonies and letters to try to back this up. This book should have been given the title Rizal the Revolutionary instead as this is the real contention of this book. This work, while contributing to the further mystification of Rizal indeed disturbs and for this alone, as a scholarly and well-written treatise in defense of Rizal, it has contributed immensely to the existing Rizaliana scholarship. I hope it will not be the last book to do so.